Ted Vogel is not a household name around racing circles today because he did most of his participation in the 1950's and did some officiating for CVRA in the 1960's; but, he was among the most important figures in racing in his region. Among his accomplishments was fielding a championship car for George Baumgardner at Stateline Speedway in the 1950's. Vogel usually had cars numbered 95. Vogel apparently started racing in the very early '50's, as evidenced by his LV photo from Pico - which only really ran from 1951 to 1952. 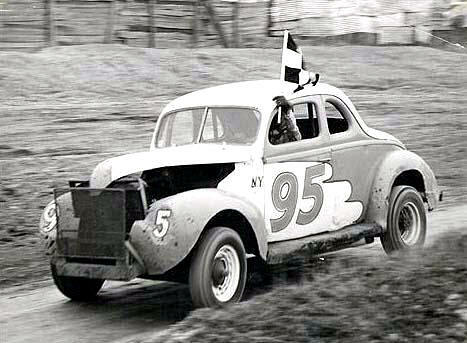 He also participated that car at his hometown Mettowee track in Granville, NY. I believe, besides Pico, Mettowee, and Stateline, Vogel cars ran at Warrensburgh, Fonda, and possibly Lebanon Valley. I am sure that future talks with him or Ted, Jr. will reveal more info. A classic shot of the LVJr leaving home for Mettowee around 1955. Ted went on to be an official for C. J. Richards, particularly at Devil's Bowl, and one son, Ted, Jr., ran for several years in divisions at the Bowl and possibly New York tracks. I appreciate the Vogels making a number of photo available. Also Mrs. Vogel's notes were invaluable in finding out some facts about local 1950's tracks. Ted, with all or most of his family, at Pico around 1951. This is supposedly the oldest car. I hear it was shot at Pico. the way to a track.